Hello! And Welcome to Full Body Vegan Cleanse! My sincere hope is for you to feel great on this Cleanse! And that you stay healthy for life! This Cleanse was developed with a number of specific goals in mind. Each of them important and each able to be reached by everyone who brings this Cleanse into their lifestyle. Step-by-Step Guide to Stay Healthy for Life! The very first goal for creating this Cleanse was to teach people how to have a very healthy lifestyle. I have spent time one-on-one with many people to structure a healthy diet. This Cleanse affords a great opportunity by reaching many people and being completely informative about how to eat healthfully, so you can stay healthy for life. Full Body 30 Day Vegan Cleanse is a step-by-step guide on how to be vegan. It teaches you how to eat real food. You will not be starving yourself on this Cleanse. The very next goal for Full Body Vegan Cleanse was that of sustainability. I wanted people to learn that they can eat healthy for the rest of their lives. This is brought about because the foods eaten through the Cleanse are truly delicious. I had lots of feed-back on almost every meal in the Cleanse and all of it was very positive. I know a number of people have kept many of these recipes in their diet even after completing the Cleanse. This Cleanse is not a quick 2-day cleanse that leaves you starving because you are only drinking certain liquids. This Cleanse is 30 days of recipes for breakfasts, lunches and dinners. And also lists recipes for fruit smoothies, and vegetable juices along with optional snacks. All of this makes this Vegan Cleanse very sustainable so you can stay healthy for life! Full Body 30 Day Vegan Cleanse also comes with 4 weeks of herbal formulas that i designed specifically for this Cleanse. For all these reasons that is why this is the best detox diet plan. 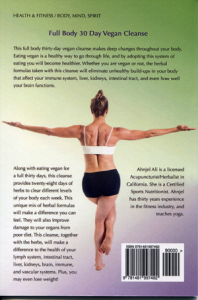 Vital as a catalyst for creating this Vegan Cleanse is the state of America’s health. As an Acupuncturist and Herbalist I am very aware of the increasingly bad health situation in America. I wish this wasn’t the case, but it is. The drastic decline in America’s health can be traced back to the 1950’s. I know that all of America can become healthy and I hope that bringing this Cleanse, this great way of life to people, will play a big role in creating changes for many families. This Full Body Vegan Cleanse was created for a number of other reasons, feel free to check back for an ongoing discussion into what these other goals are and how the Full Body Vegan Cleanse has already helped people stay Healthy for Life!.